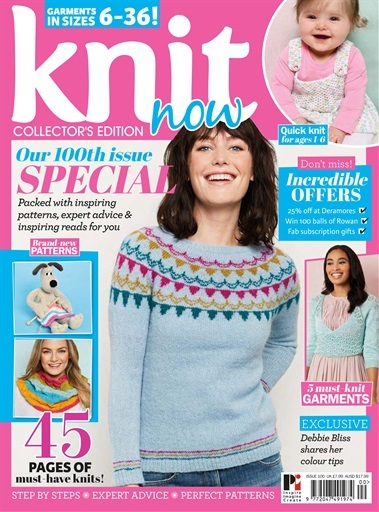 This month we’ve got a special 100th edition of Knit Now! I can’t believe we’ve made it to issue 100 – it seems like only yesterday that I was calling my mum to tell her I’d got my dream job and starting work on issue 1! Our cover garment is from one of my favourite people in the whole world, Anna Elliott. She’s been with us since the beginning and if you’re feeling nostalgic, you’ll find her first pattern for us in this issue’s supplement. We’re also welcoming some new names, including Julie Dubreux. I think she’s one of the most inspiring designers working at the moment and I’m so excited to welcome her to the Knit Now family. 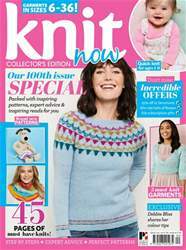 Another knitter we’re excited to include in this issue if Gromit! Fans of the Wallace & Gromit films will know that this clever canine is a keen knitter, so we couldn’t think of a more perfect character to create a knitting pattern for. I loved giving him some needles and a project to work on – my girlfriend made the needles for me by cutting down an inexpensive bamboo pair. If you don’t fancy casting on just yet, why not grab a cup of tea and a slice of birthday cake and settle in for a good read? 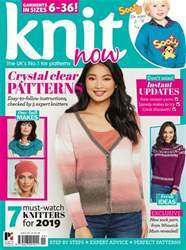 We interview knitting royalty Debbie Bliss in issue 1, so I though it would be fun to chat to her again. We’ve also spoken to an up-and-coming designer who I think is going to be huge – Frenchie from Aroha Knits. 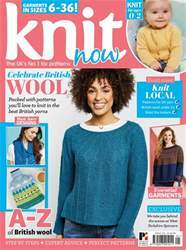 Finally, if you can’t wait for the next 100 issues, don’t miss out incredible subscription offer – our birthday present to you is a set of needles worth £96 when you subscribe!